The students of the MFA Sound Art program, and the Music & Arts Library present a night of engaging site-specific installations, performances and more, situated in the spaces of the Library. Drop in to check out the work! Light refreshments will be served. The event is open to Columbia and Barnard students, staff and faculty. 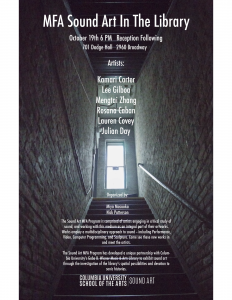 This entry was posted in Announcements, CU Community Performances, Events, Free, Fun, Sound Arts and tagged CU Community Performances, Events on October 9, 2018 by Nick Patterson. 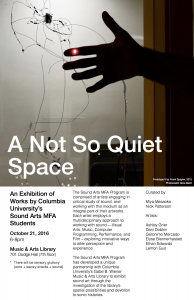 The Music & Arts Library and the Sound Arts MFA Program cordially invite you to “A Not So Quiet Space”, featuring work by the current students in the program, utilizing the space of the Music & Arts Library for temporary installations and performances. Come join us for some interesting sounds and experiences! Friday, 10/21, from 6-8pm, in the Music & Arts Library, 701 Dodge. (CUID required or contact patterson@columbia.edu to RSVP). This entry was posted in Announcements, CU Community Performances, Events and tagged Announcements, Events on October 12, 2016 by Nick Patterson. The Dept. 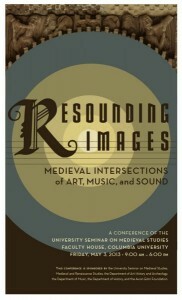 of Music co-sponsors this interesting interdisciplinary event, on Friday, May 3, from 9am-6pm, as part of the University Seminar on Medieval Studies. Prof. Susan Boynton, from the Music Dept. faculty, will present opening remarks. Distinguished speakers from several institutions will present a fascinating and varied program. Full details are available at this link (note that registration is required for the conference, although it is free). 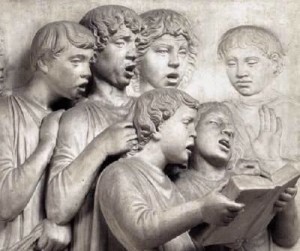 There will be an associated concert by members of Columbia’s Collegium Musicum, and others, of Byzantine and Latin chant, performed in the Burke Library, on Saturday, May 4, at 3pm. Details on the concert can be found here. Both the conference and the concert are free and open to the public. This entry was posted in CU Community Performances, Events and tagged CU Community Performances, Events on May 2, 2013 by Nick Patterson. The event is free and open to the public. There will be a post-talk dinner, but note that this requires an RSVP and a fee of $25. Full details of the program are available at this link. This entry was posted in Events and tagged Events on April 10, 2013 by Nick Patterson. On Thursday March 14th, at 6:30pm, Columbia Music Dept. Professor Giuseppe Gerbino will take part in the event “Music under the Medici in Renaissance Florence“, at NYU’s Casa Italiana Zerilli-Marimò 24 West 12th Street, New York, NY 10011. The event will feature newly reconstructed music for Carnival Songs by Lorenzo de’ Medici. Prof. Gerbino will be joined by Jane Tylus (NYU), Patrick Macey (Eastman School of Music), and voice students from the Eastman School of Music. This event is part of the ongoing series Recitar Cantando – Conversations on Italian Music and Literature. This entry was posted in CU Community Performances, Events and tagged CU Community Performances, Events on March 14, 2013 by Nick Patterson. 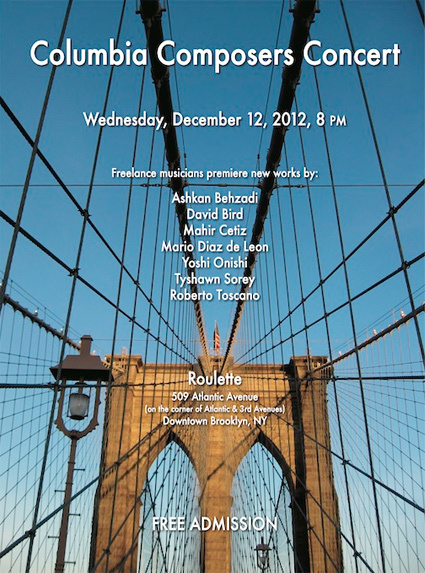 Come out for a night of exciting new music, with performers including the Mivos Quartet. This entry was posted in CU Community Performances, Events and tagged CU Community Performances, Events on December 3, 2012 by Nick Patterson. Columbia’s first-rate vocal ensemble Collegium Musicum presents a concert on Wednesday, Dec 5, at 8pm, in St. Paul’s Chapel on the Morningside campus of Columbia University. The concert will feature works by Byrd, Josquin, Brahms, and Debussy. Full program details are available on their web site. The concert is FREE and open to the public. Take a break and refresh yourself with some beautiful vocal art! 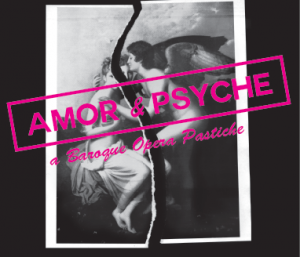 Opera Feroce presents Amor & Psyche, a “Baroque opera pastiche”, on Monday Nov. 11, at 6pm, in the Burke Library at Union Theological Seminary. Running time is 90 minutes (with intermission). DIRECTIONS: Enter at Union Theological Seminary entrance on 121st and Broadway. Burke Library, 3rd Floor Reading Room. For information or questions, please contact Anthony J. Elia, Public Services Librarian at aje2117@columbia.edu. RSVP preferred but not necessary. A review of a past performance can be read at this link on the New York Times site. This entry was posted in CU Community Performances, Events and tagged CU Community Performances, Events on November 8, 2012 by Nick Patterson. All Columbia students, staff, and faculty are invited to attend Scopus Day on Wed. Oct 31, 2012. Scopus is “…a large citation and abstract database, covering all subject areas. It contains nearly 18,000 peer-reviewed journals from more than 5,000 publishers with a range of advanced research features”. So, if you’re researching in music, why would you use Scopus? While it’s true that the major journals in music are indexed in the music literature indexes Music Index Online, International Index to Music Periodicals (IIMP), and RILM, so much scholarly work being done now is interdisciplinary, and you may be surprised at the useful and relevant content that you can find searching in Scopus, in journals outside of the usual music-specialized titles, especially if your research interests overlap with the sciences. Another useful feature is citation tracing; you can see which other articles (and how many) have cited a given article. Whether you can attend the Scopus Day trainings or not, take a look at Scopus and do some test searches, to discover the kind of content which is available. You’ll notice the “E-link” icons on much of the content; click on those to see if they can easily find full-text content available through the Libraries’ subscriptions (if they can’t, don’t despair – check with your reference librarian for further possible options). Let us know if you have any questions, as always, at musiclibrary@columbia.edu. This entry was posted in E-Resources, Events, Tips & Tutorials and tagged E-Resources, Events, Tips & Tutorials on October 24, 2012 by Nick Patterson. Music Dept. 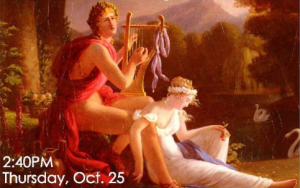 Prof. Susan Boynton will present a lecture titled “The Beginning of Opera in Italy”, at 2:40pm on Thursday, Oct. 25th, at the Italian Academy. The event is free and open to the public. For RSVP and full event details, follow this link. This entry was posted in Events, Faculty and tagged Events, Faculty on October 24, 2012 by Nick Patterson.